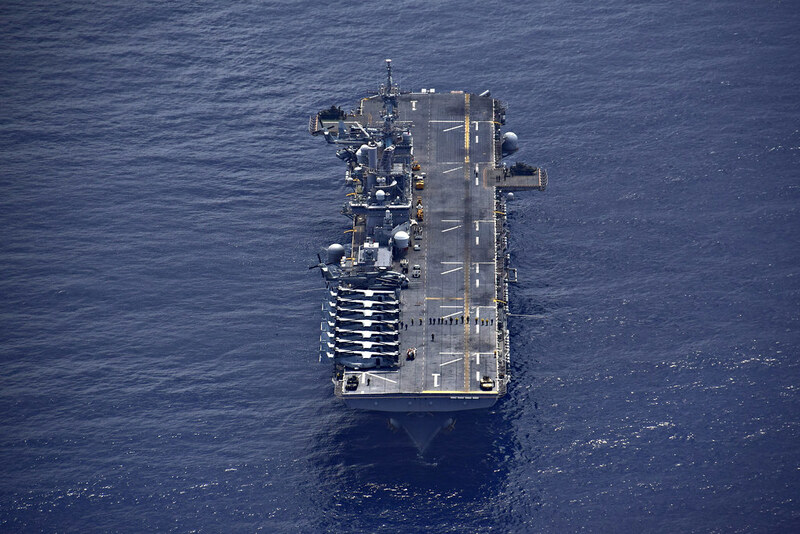 SOUTH CHINA SEA - The USS Wasp (LHD 1) Amphibious Ready Group (ARG) with embarked 31st Marine Expeditionary Unit (MEU) conducted an integrated Defense of the Amphibious Task Force (DATF) drill at sea, Sept. 27. DATF scenarios focus Navy and Marine Corps forces on defending ARG shipping and the drills allowed the ARG-MEU team to improve their proficiency when integrating fires. The DATF drill included firing crew-served weapons attached to Wasp, such as .25 caliber and .50 caliber mounted machine guns. Marines assigned to Battalion Landing Team (BLT), 2nd Battalion, 5th Marines (2/5) expended rounds using Light Armored Vehicles’ M242 Bushmaster 25 mm chain guns and .50 caliber mounted machine guns on Humvees. The drill also allowed Marine snipers to fire M107 semi-automatic sniper rifles, and machine gunners to employ lethal fires with M-240B medium machine guns. Sailors and Marines fired on an inflatable gunnery target commonly called a “killer tomato” while maneuvering in open seas. 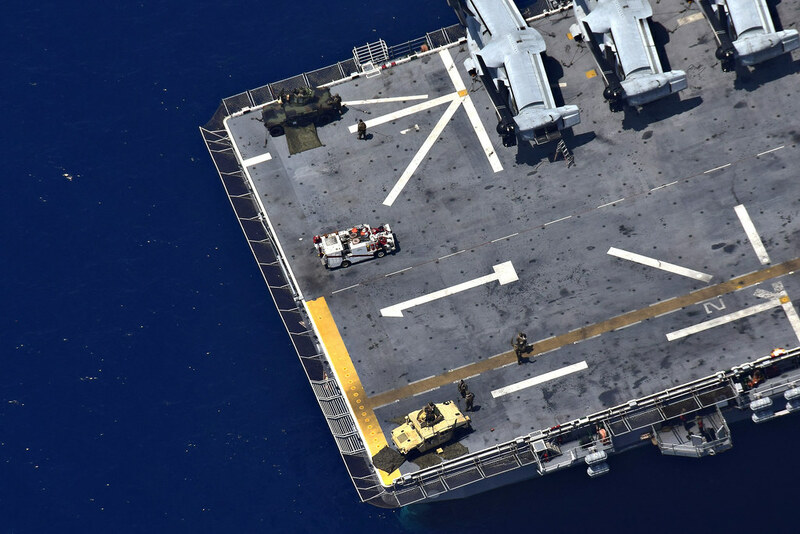 In addition to deck–based live fire, SH60S Sea Hawk helicopters assigned to the “Island Knights” of Helicopter Sea Combat Squadron 25 practiced their air defense capabilities, fully integrating air superiority capability with shipboard-fired weapons. 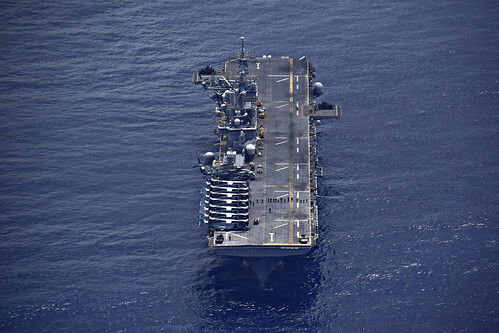 The helicopters operated within safe distance of the ship while also observing the firing range from the air to ensure safe operations during the drill. 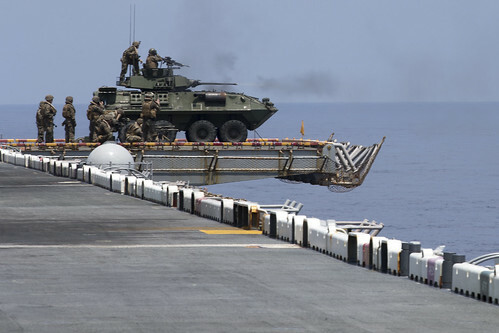 While at sea, Wasp and amphibious dock landing ship USS Ashland (LSD 48) have both conducted live-fire exercises in tandem with the 31st MEU, allowing the ARG-MEU team to enhance their combat effectiveness and maintain proficiency to support contingency operations in the Indo-Pacific region.